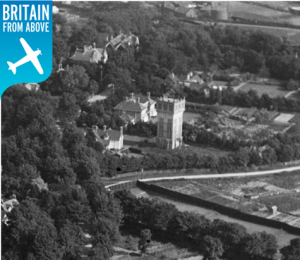 Please note the Water Tower is now a private residence. 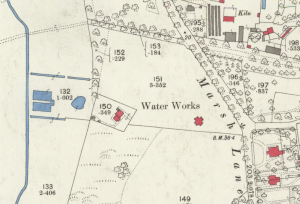 The above map extract (1881) shows the location of the water works. Far left are the abstraction reservoirs coloured blue. These were connected by pipe to the pumping station, coloured red, to the left of the water works descriptor. The pumping station was connected by pipe to the water tower, coloured red, immediately below the ‘s’ of the water works descriptor. The pipe from the water tower originally led down the Town Steps to the High Street. 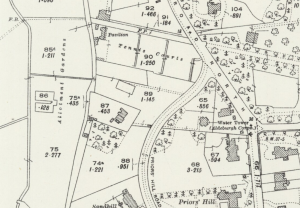 Marsh Lane on the 1881 map is now Park Road, and Priors Hill Road has since been constructed (see 1926 map below). 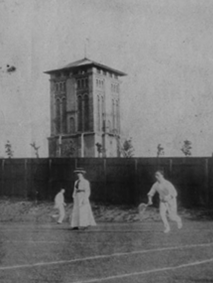 The Water Tower c.1905. Image courtesy of Chris Whately-Smith. 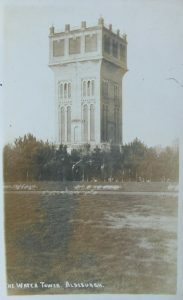 Postcard View of the Water Tower. June 1920. Britain from Above. 26 February 2011 © Adrian S Pye and licensed for reuse under a Creative Commons Licence. 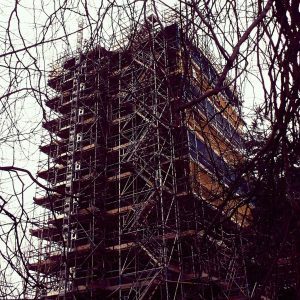 Shrouded in scaffolding 24 March 2016. © Cud05 and licensed for reuse under a Creative Commons Licence. 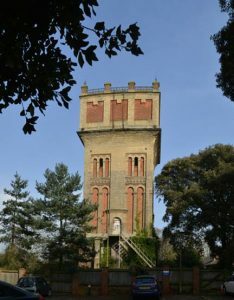 The conversion of a Grade II listed water tower into a six storey family home is hoped to begin “as soon as possible” after amended plans were given the go ahead. 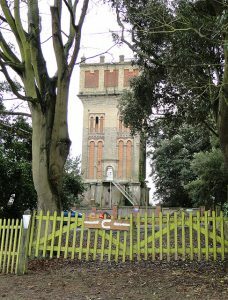 Architects redeveloping the 22-metre tall tower opposite Aldeburgh community hospital said work could begin as early as September after permission was granted on Wednesday. Suffolk Coastal District Council’s north area planning committee chairman Debbie McCallum said the proposals were “extremely exciting”. She described the project as a “labour of love” after learning that it was being carried out in memory of the owner’s dead wife. The application, which will see the 19th Century landmark fitted out with living space over six storeys, was first approved in 2012. Then, the proposal was for a minimalist “glass cube” to be built around its ground floor with a roof terrace at the top. Resubmitted plans have replaced the cube with three copper clad “modules” around the north, east and west of the tower and include alterations to the basement wine cellar. The planning officer’s report identified the alterations as being “slightly more beneficial in terms of its relationship with the neighbouring amenity”. Solicitors on behalf of the hospital, however, raised concerns about the development’s “unacceptable detrimental impact on the staff and residents” and called for a “construction management plan” to be submitted before work begins, addressing difficulties over contractor parking, access, noise and dust. The League of Friends of Aldeburgh and District Community Hospital also submitted concerns about disruption and privacy. Committee members, however, welcomed the application, which they felt would preserve an important building that might otherwise be left to deteriorate. Dominic Goldfinger, of Polyhedron Architecture Ltd, told the committee he was keen to begin work “as soon as possible” and expected the project to take between 10 and 15 months to complete. It is landmark building which enjoys panoramic views over one of Suffolk’s most upmarket coastal towns – and there is now an international scramble to own it. 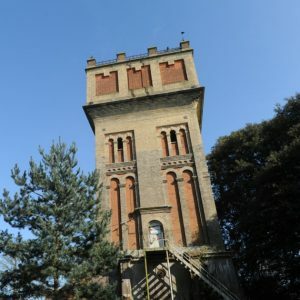 Standing in the heart of Aldeburgh, the redundant water tower was built in the 1870s and is set to be auctioned off for a guide price of £175,000. But there has already been interest expressed from East Anglia, London and America, and auctioneers expect a much higher price to be paid. More than 100 people have also attended two open days at the property in Priors Hill Road, adjacent to the community hospital. 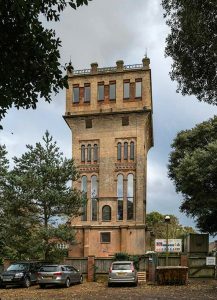 It is obvious that whoever buys the tower will enjoy panoramic coastal views after they have poked their head through the roof hatch and stood on the parapet. But a future use for it will ultimately depend on a decision by planners at Suffolk Coastal. 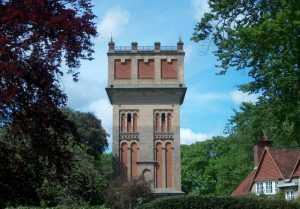 There are some water towers still in use in Suffolk, including Leiston and Saxmundham, and there are others, most notably the nearby House in the Clouds at Thorpeness, which have been turned into a des res. The tower is being sold by Northumbrian Water Ltd on Monday at 10am at a Savills auction in the Millennium Hotel, Grosvenor Square, London.